The Japan Agency for Marine-Earth Science and Technology (JAMSTEC) investigates and observes deep-sea environments using manned and unmanned research submersibles such as SHINKAI6500, HYPER-DOLPHIN, etc. On this site, the numerous data of deep-sea videos and photos are available to the public. As of October 2018, approximately 38 thousand hours of videos and over 1.5 million photos are available at this site. These data of moratorium periods have expired, and the site provides them with detailed information including research location, contents (ex. living organism or phenomena), etc. Moreover, this site visualizes JAMSTEC dive surveys and deep-sea environments by using various deep-sea data and plotting dive tracks in 2-dimensional and 3-dimensional virtual space. You can search by keywords, hierarchical classifications, and dive information. Search results are displayed in thumbnails, and click them to play videos and view photos. In addition, you can download more than one video/photo at once and apply for the highest-resolution videos we can offer by adding them to My Library. *You need to register/login for downloading videos/photos and using My Library. You can view and operate 2D/3D dive track and environmental data based on CTD data along with its dive videos. The website provides users with access to the 5,529 dives of videos and photos taken by six manned and unmanned research submersibles in 1982 to 2016. Click a name of submersibles above to find more about a submersible. It will take you to the JAMSTEC's site where a submersible are explained in details. Values of total length of all videos are approximate. All of the videos and photos have information that was taken during dive surveys, including dive dates, dive areas, etc. We, operating staffs of the website, have watched and cut editing all of the videos and photos to classify organisms and geological environments based on literature, cruise reports, etc. ※The biological classification is based on BISMaL（Biological Information System for Marine Life) . 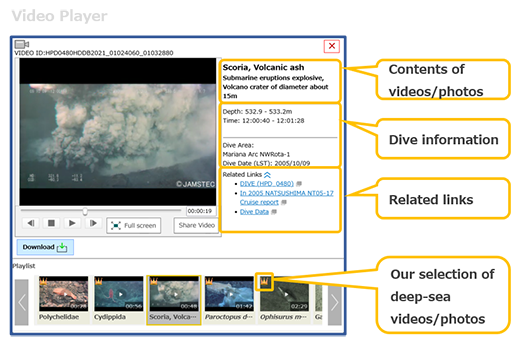 Some of the videos and photos have keywords that show habits of organisms: crowd, forage and eating, etc., and they also show stages of dive processes: descending, sampling, etc. In case there are public relations and academic journals related to videos/photos, you can refer to JAMSTEC Document Catalog at "Related Links" of the player/viewer. Selected and recommended videos and photos have crown marks ; among them, highly recommended videos are introduced on Staff's Favorite Deep-sea Videos. Although high-resolution photos are available on this site, the resolutions of videos are low due to online services. High-resolution videos are archived and provided to users upon their request. Please refer to Terms and Conditions for more detailed information. 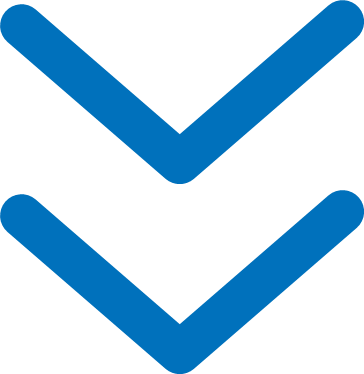 Two-dimensional and three-dimensional dive tracks are based on CTD data of dives, including information of time, latitude and longitude, and depth. Please see README of each dive's CTD data, which is available in Data and Sample Research System for Whole Cruise Information in JAMSTEC (DARWIN) , for more details. The basic information available on DARWIN and this website are displayed, including dive dates, dive area, representative location of dives, and dive purposes. Representative dive locations are used to display bird's-eye view from the sky. Dives' CTD data of water temperature and salinity available on DARWIN are made into graphs. Rocks and organisms sampled by submersibles available on DARWIN and Marine Biological Sample Database are displayed on this site. Please click on a sample thumbnail for details; a window or tab of its sample page on DARWIN or Marine Biological Sample Database will open. Data used for background maps are in the following.